I was rowing up the Nile the other day, from a bit above the Temple of Luxor to Crocodile Island. Rowing against the stream on an afternoon when the heat of the day is beginning to ebb is an experience I recommend – so long as you stick close to the West Bank where the current is not so challenging. You can steer a changing path between the sandbanks and the reeds, and, as you pull on the oars in the silence, you can hear the immensely varied bird song – and catch sight of purple herons, pied kingfishers, egrets, and above (though you rarely look that high when working the oars) the black kites sailing the updrafts. Of all the great rivers I have seen and been on: the Amazon, the Mekong, the Danube, the Rhine and, yes, good old Father Thames – it is the Nile that speaks to me most of all. Why? 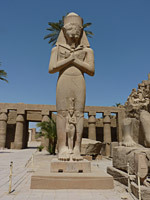 It is difficult to say, though I keep on coming back to Luxor. I never seem to tire of walking past the colossal two seated figures into the main aisle of Amon-Ra’s temple in the middle of the town; and I continue to be amazed, further downstream, by the Temple of Karnak with its stupendous hypostyle hall (which reputedly can easily contain the whole of Notre-Dame in Paris). It dates from 1375 BC. The powerful columns, 134 of them standing 23 metres high, are covered in hieroglyphs (some with traces of their original colour) and seem to rise inexorably to the perfect blue sky; everywhere are the friezes of Isis, Osiris, Seti, Amon-Ra, Anubis and Horus, always so elegant, so beautifully proportioned, and so still. I suppose it is this stillness that I find so affecting, and so unexpected. Luxor is a teeming Egyptian town overrun with noisy taxis and numerous caleche drivers plying their tourist trade (now, at least, proclaiming how healthy their horses are). Yet despite the tourists and the trade, empty spaces can be found easily – even in the much-visited temples themselves. If you stand on the East bank just outside Luxor in the early morning and look across to the West bank, you can see the towering cliff. Behind this is the Valley of the Kings, the Valleys of the Queens and the Nobles, and the Mortuary Temple of Queen Hatshepsut. The feeling of looking across the water with its smooth flow is primarily one of stillness and timelessness. The feluccas seem to move effortlessly, the green reeds on the other side are motionless, and you truly seem to be in a culture that goes back 5,000 years. Before, that is, the first of the big Nile pleasure boats appear, beating upstream to Aswan. Curiously, I am drawn to the matchless poise of the art of ancient Egypt more than Greece or Rome. I grew up with the myths of Theseus and Perseus, Pallas Athene and Prometheus; Odysseus and his travails still echo in my imagination. Homer was one of the first recordings I planned when Naxos AudioBooks started in 1994, and we still return to that classical European source: our new recording of Thucydides’ The History of the Peloponnesian War is due for release in August. Of course, Plato and Plutarch and Herodotus are embedded in Western literary tradition, so my feelings of familiarity here are understandable. And yet I stand entranced before the Colossus of Pinedjem at the Temple of Karnak, more, perhaps, than when I stand before the Parthenon! ‘Ah’, said a friend of mine, ‘but it is with Greece that humanity enters human representation.’ Perhaps. 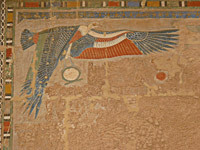 Yet, there is something about the stylised positions of the ancient Egyptian figures, the remarkably vivid colours in the tombs, the thrilling and oh-so-imaginative corner picture of a vulture on a wall, which speaks volumes to me. Such ruminations are timely as, this month, we release Ancient Egypt – The Glory of the Pharaohs, an introduction for younger listeners to the myths and history of this culture. It follows the series we have developed over the years of the Greek, Norse and Irish myths as well as the rulers of Rome. The Glory of the Pharaohs is an absorbing tale and one which, I hope, will kindle sufficient interest in younger listeners (and their families!) to make them want to venture out to Egypt, so that they too can wander among the massifs of Karnak, plunge into the tombs of Seti I and Thutmosis III; and even take a boat and row up the Nile, as people have been doing for thousands of years.